No Number - "Fun With Food All Year Around Cookbook"
Number "Fun With Food All Year Around Cookbook"
Description: This soft cover Fun with Food Cookbook gives helpful safety tips, cooking tips, and food ideas. 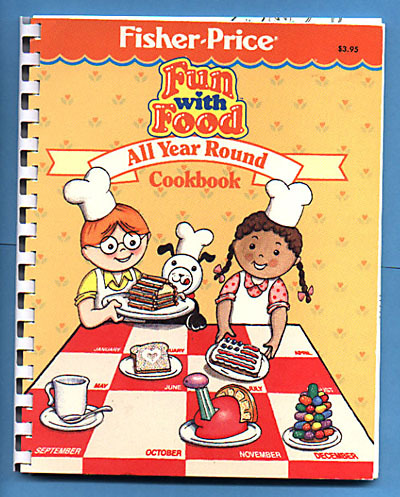 FPT19884 - Soft cover book titled "Fun With Food All Year Round Cookbook" with a white plastic spiral bound edge. The book cover is light orange with flower print designs on the edges, a dark orange and blue Fisher-Price awning bar across the top with "Fisher-Price" in the center in white, and a picture of a Little People boy, girl, and Lucky Dog in a kitchen.